Thanks for visiting and for supporting the spread of Inspiration and Motivation everywhere! How exciting!! … My first book!! And much to my awe … delight … and wonder … Life seems to be supporting it’s journey and sales into many varied and wonderful places … organizations … and areas of the country and world that I definitely had not foreseen. 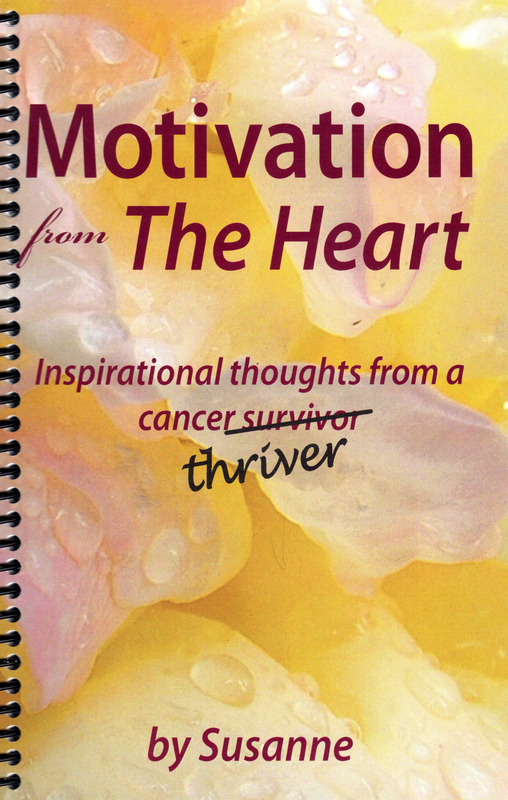 “Motivation From the Heart –Inspirational thoughts from a Cancer Thriver” – Volume 1 – is a compilation of Inspirational posts and thoughts written during my 3 year-long battle against … not only a rare form of bone marrow cancer … but also a nasty, resistant bacteria that eventually ate up my left hip, part of my left femur and bunches of muscle. Good news! I now have a state-of-the-art … cutting-edge-technology new hip … and a new titanium femur! I’m here. I’m in remission. And after a year of physiotherapy I’m walking again! Hooray! As you can imagine there were good days and dark days … but through it all I still maintained that we have internal choices about how we are going to feel and approach the circumstances in our lives. Inner Perky Polly had some challenging days and Sunshine Sue got used to carrying an umbrella …but ultimately it was and is the positive nature of myself … my friends and family … and of course Life Itself that brought me through… everything.